It's the HULK from the Mighty Avengers! 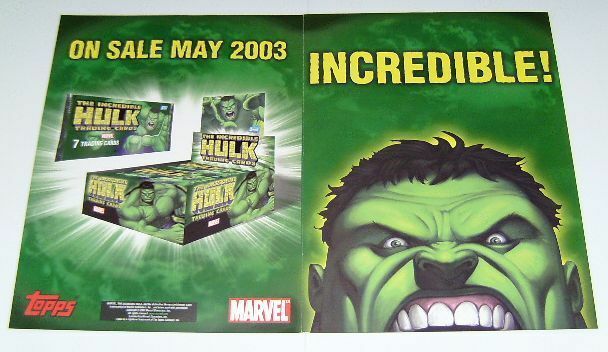 This is a SUPER RARE 2003 Incredible Hulk promotional brochure/flyer poster that was designed to advertise the Hulk trading card series by Topps. This brochure is 2 sided, and is folded (which is normal. Once you open it up, it could be used as a poster of course. 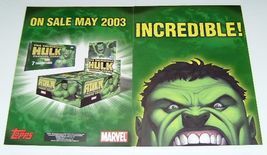 This Hulk brochure measures about 17 by 11 inches when unfolded, and shows artwork by JACK KIRBY, JOHN ROMITA JR, JOE JUSKO, etc. This comic dealer's promo brochure flyer/poster was NEVER FOR SALE TO THE PUBLIC AND MADE IN VERY SMALL QUANTITIES. 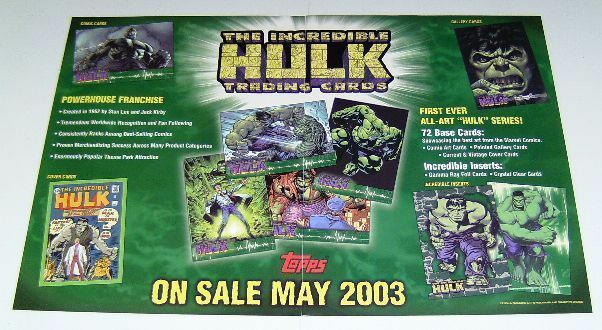 Please note that THIS LISTING IS FOR THE HULK BROCHURE FLYER POSTER ONLY, and not for the actual Topps trading cards shown on this brochure. This item is in VERY FINE/NEAR MINT CONDITION.